Marshal George Higgins: It seems mighty funny to me that every time this gang organizes a rodeo, their own men win all the first prizes. When it begins to look like an outsider is going to win, he gets sick. Two or three has even died from it. John Weston: Well, you can't arrest them for that, Marshal. Marshal George Higgins: No, maybe not. But it's might peculiar that when these outsides fall off them top broncs, they're suffering from snakebite. I tell ya, it just ain't natural. John Weston: What do you want me to do? Get snake bit? At the start of this Lone Star cheapie, the Duke strays into Roy Rogers territory as he warbles in a worryingly light voice while trotting along on his trusty steed - and one can only speculate on how foolish he must have felt. Thankfully, our hero quickly becomes too involved with a crooked rodeo gang to 'entertain' us with any more serenades as he 'bulldogs' and 'Roman Rides' and does all the other things an honest cowboy has to do to get in with a gang of crooks. Subsequent fame has given us a kinder opinion of Wayne than he probably deserves in terms of his potential in these early days. Ford saw something there, but nobody else in Hollywood did, and Wayne spent most of the 30s trudging from one no-budget potboiler to another. He's better than most of the cast in this flick, but there's little to indicate the massive star power he would one day possess - it's only his size that seems to give him a presence (and that, if truth be told, is what Wayne was - a screen presence rather than an accomplished actor). All these flicks were padded out with interminable shots of cowboys riding very fast on their horses, and this one's no different. But in this one we're also treated to lengthy scenes of rodeo riders - which are actually more interesting than the horse-riding fillers, even though the numerous shots of men twisting steers' necks to near-impossible angles in order to floor them and prove their macho status are not pleasant to watch. And the Indians - who were rarely a feature in the Lone Star flicks - are relegated to the status of rodeo sideshow acts here. 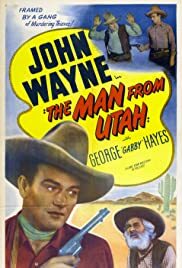 THE MAN FROM UTAH is by no means the worst of the Lone Stars pics (of the ones I've seen, that particular wooden spoon is reserved for RANDY RIDES ALONE) although the superhuman status given to Wayne's character is a bit over the top. Probably the best from this era is THE LUCKY TEXAN, so if, for some bizarre reason, you're in a position to choose between the two, be sure to plump for the Texan.